This site focuses on the Tibetan Vajrayana Buddhist pantheon. Each of the beings named here represents a unique spiritual personality or essence. The principle beings are the five Dhyani Buddhas- the esoteric meditation Buddhas of the five colors found in The Tibetan Book of the Dead and other sources. 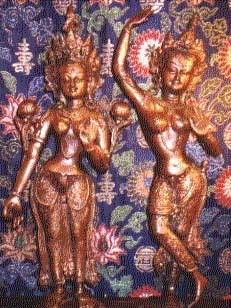 These works may be seen as part of a long tradition of experiential or vajra songs which arise from the meditation of practitioners of Tibetan Buddhism. 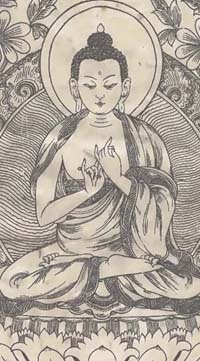 Milarepa and other lineage holders used contemplative poetry or "songs" to convey their message and inspire their followers. The contemplative poetry presented here evokes the thoughts and images of the beings of Vajrayana tradition often using the metaphor of music. Each poem can be looked at as a meditative exercise or visualization designed to tune the reader to the state of mind or spiritual environment of the being that is speaking. The purpose is to introduce the spiritual seeker to elements of the Vajrayana Buddhist tradition outside the bounds of a particular lineage or school. When a Tibetan monk or nun is initiated into one of the older Vajrayana lineages, he or she is sometimes given a Yidam who serves as a spiritual guide, protector, and a focus of meditation. The practitioner does meditation to forge a strong link with this inner guide and teacher. One of the beings listed below is often chosen as a Yidam or guide for the initiate. This process is usually called guru yoga or deity yoga. One function of these guides is to inspire creativity, for they can serve as muses. However their traditional role is guide to the spiritual traveler who seeks knowledge of and access to the many inner worlds one may encounter during meditation. This kind of visionary experience is a stepping stone to the ultimate Buddhist goal of liberation from suffering (enlightenment). The contemplative images here can serve as maps describing the geography of the inner spiritual worlds. They can also familiarize the reader with the values and ideals of Buddhism and the Tibetan tradition. We hope that the material presented here will encourage an interest in Tantric Buddhist meditation and visualization, and make the infinite realms of Spirit more accessible to the seeker. Vajrasattva is the Buddha of diamond-wisdom, and is the chief Buddha of the five Dhyani Buddhas. Vajradhara is the Adi-Buddha for both the Red-cap and Yellow-cap Vajrayana schools, as well as the lord of all mysteries and master of all secrets. Vajradhara, or he who holds the thunderbolt is said to conquer and subdue all evil spirits who are the enemies of Buddhism. He presides over the eight Dharmapalas who are the ferocious defenders of the dharma. Amitabha's color is red. He is known as the Buddha of discriminating wisdom as well as the Buddha of infinite light. His bodhisattva or spiritual emanation is Avalokiteshvara, the bodhisattva of compassion or he who looks on the universe with the eyes of compassion. Ratnasambhava's color is yellow. He is the Buddha of the wisdom of harmony and equality. His bodhisattva is Ratnapani - the jewel-bearer who holds the cintamani (wish-fulfilling gem). Aksobhya's color is blue. He is the Buddha of mirror-like wisdom and is known as the Immovable One. His bodhisattva is Vajrapani- the bearer of the thunderbolt (vajra). Vairocana's color is white. He is called the maker of perfect light. His spiritual emanation is Samantabhadra, the bodhisattva of universal kindness. Amoghasiddhi's color is green. He is the Buddha of all-accomplishing or all-perfecting wisdom. His bodhisattva is Visvapani, the double thunderbolt bearer.